The Frametek framing system utilises cold roll formed 78mm x 38mm and 90mm x 40mm galvanised, lipped 'C' section members in either 0.55, 0.75 or 0.95mm gauge high tensile G550 steel with a tensile and yield strength of 550Mpa. Framing is designed in house using our fully integrated engineering detail software. Once the design is completed the information is electronically transferred to rollforming machines for manufacture and assembly to exact dimensions. The fully computerized and integrated design and manufacturing system means that every wall is straight, square and true. Resulting in faster, easier construction with simpler installation of services and a better fit for doors and windows. Framing comes complete with bracing, battens, noggs, window and door lintels, structural members, openings and pre-punched holes for services. 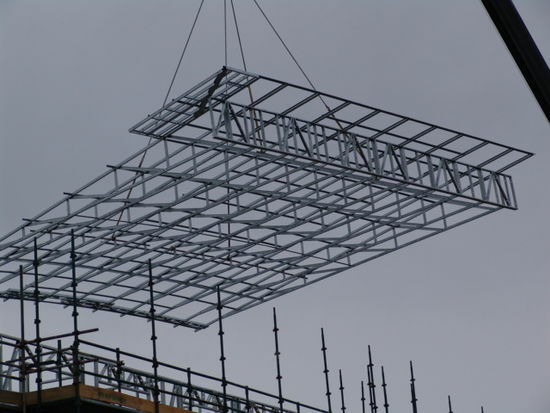 Steel framing is installed by a 2 or 3 man site team consisting of quality tradesman and apprentices. Typically, two men can erect a single story house in 3 days.